On Wednesday evening, Sept. 16th, from 7 to 9PM, at least fifteen candidates for local county and city offices addressed questions on “Building an Economy for Climate Stability” to a large gathering at the Harley School in Brighton. It was a unique opportunity for voters to hear their potential leaders speak about how they would help create a climate for green jobs and address Climate Change locally. Everyone in the room at Harley had a chance to hear the science of Climate Change urgently brought to the local level from their well-informed and enthusiastic candidates. Except the Rochester media was not there. Not one. Not only that, but none of our local media (except Rochester City Newspaper and WXXI’s “Connections”) helped promote this critical local forum that attempted to address the crisis of our age. 1. The forum in question--“Building an Economy for Climate Stability Candidate Forum 2015”—included the word ‘climate’. ‘Climate’ brings to mind the phrase “Climate Change’. As everyone knows, Climate Change is very controversial in the Rochester region—even though 97% of climate scientists say that it is happening, it’s human caused, and we need to do something about it. Rochester media doesn’t want to have elections about controversial stuff. If the forum had been about puppies, sports, or keeping taxes low, Rochester media would have felt safe enough to let the public know about the forum. 2. Pope Francis didn’t attend the forum. 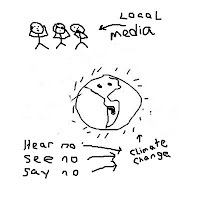 Even though he has written one of the most powerful and cogent books on the need to address Climate Change in his encyclical, if Pope Francis had attended the forum, Rochester media would have filled the room. The media would have fallen all over itself to promote this event. But then there wouldn’t have been any room in the room for the public. The public would have been forced behind barricades several blocks away from the forum, only able to pine longingly for the Pope’s attention. So we are pretty certain that the local media, as goes the GOP Catholic presidential candidates, would just as soon have the Pope stay home at the Vatican so no one feels morally compelled to act. 3. The GOP Monroe County executive candidate didn’t come. If she had come, Rochester media would have done everything in their power to promote this event and cover it because she is the sure winner. Our media likes winners, winners of races, winners of lotteries, winners of anything really. But the GOP Monroe County executive candidate didn’t come because the media didn’t promote the event and threaten to cover this forum. If the media had threatened to come, then the GOP candidate would have had to come. I know, this crazy logic is Catch 22 but that’s how local politics works. If you are going to win the election anyways, why go to a forum where you’ll have to disclose how you would lead on Climate Change? You might not even believe in the science of Climate Change. Duh! And so speaking to the public on Climate Change would be very awkward and needlessly threaten your lead. It’s easy: if you’re going to win anyways you have to be pushed by the media to talk to the public about things you don’t want to talk about, and you’re certainly not going to be pushed by a media that doesn’t see the point of a democracy. 4. Rochester media was too busy watching the National GOP debate that evening and besides no one as colorful as Donald Trump was scheduled to be at the local forum. If Donald Trump had been at the local forum, instead of performing on national TV, Rochester media would have had a chance to publish some very quotable (though crazy) quotes from the Donald. But he wasn’t, so they didn’t. 5. Rochester, as everyone knows, is in a sweet zone and not subject to the laws of physics. The world is burning up, but not Rochester. Proof of this is weather for the last two winters (we’ll forget about the last two decades) was very cold; we had a very picturesque winter with lots of snowmen and children sledding. 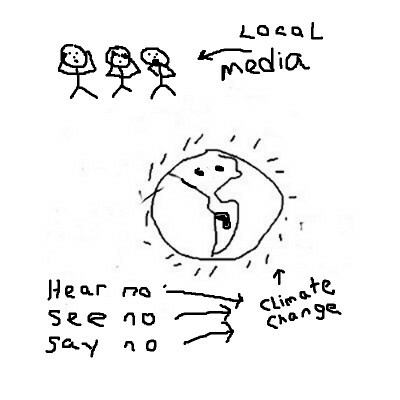 Rochester media thought it the height of absurdity to cover an election forum about our region addressing the consequences of Climate Change—when we weren’t experiencing any of those alleged consequences. It would be like covering a story about the best way to get to the Emerald City when there isn’t even a Yellow Brick Road to get there. 6. The Rochester media didn’t know about this event. All local media’s email went down at once just as they were being contacted by the Rochester People’s Climate Coalition (RPCC) and the League of Women Voters; all of the hundred-plus candidates contacted conspired to keep it a secret; and (risking your incredulity further) the media has been oblivious that an election is coming up this year and has completely failed to keep up with related events. Once the public understands that the media is a business and not an information system, it’s easy to understand why Rochester media would not go out of their way to promote and cover an event that wouldn’t bring them any money. As a matter of fact, if they were to imply by their very coverage of this event that Climate Change was important enough to cover, the media might find that many of their subscribers would unsubscribe. Why would customers attend to a media who published stuff they didn’t want to hear about? Or, because the media hasn’t been connecting the dots locally on Climate Change over the years, then suddenly attending a forum on addressing Climate Change, it could cause their customers to question why customers were buying into this dysfunctional media in the first place. The media, for various reasons, did not choose to cover this forum. And so once again those concerned about this worldwide crisis as it pertains to our region grind away ineffectually in a silo of silence—a place where the rest of the community isn’t bothered by this crisis (until they are by the laws of physics). Rochester goes on ignoring the fact that it is the job of their elected officials to protect them on a planet that is quickly warming.